Why Are We Different? It’s Our Research! A couple of months ago, we assisted Mark and Kylie purchase their first investment property. This second property, whilst well presented, has been selected because it meets our strict criteria – it’s in one of PROPERTYOLOGY’s strategically selected cities (which is actually in a completely different state to their first property) and identified growth drivers include expanding education, agriculture, health and tourism industries. Being in the right location however, is only half the job. If you’ve ever spoken to our specialists Bryan Loughnan or Euan Rose about our selection process, you’ll know that we don’t choose properties by how it looks or even a suburb name. PROPERTYOLOGY’s research process drills right down to such a micro-analytic level, where we will only consider buying properties that are the exact chosen dwelling style and located on specific streets. Generally, it could be less than 10% of streets within a chosen city which make our “acceptable” list. Our street selection takes in to account things such zoning, flood maps, traffic congestion, employment nodes, proximity to social infrastructure, public transport, crime rates, demographics, gentrification plans, and more. It’s only after our intensive research is complete that we then commence a more traditional buyer’s agent service, using our skills to negotiate to purchase a property at the very best price possible for our clients. 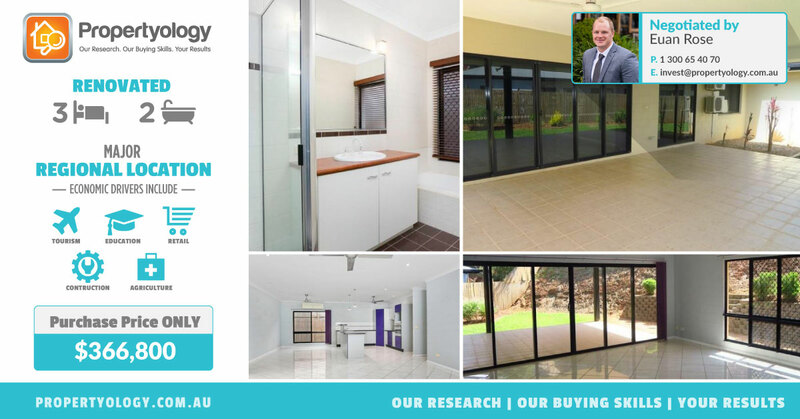 In this case, the property was listed for sale with a price guide of “Offers Over $369,000”, and even with the vendors expectations of being in the $370,000’s, our Buyers Agent Euan Rose was were able to negotiate a purchase price of only $366,800 for Mark and Kylie – a fantastic overall result in what we consider to be quite an exciting market for this large, well presented 3-bedroom, 2-bathroom family home! Even though this particular property has only just settled, our team have already started the search for a third investment property for Mark and Kylie. For the record, once this next purchase is finalised, Mark and Kylie will be the proud owners of four properties (including their family home) across three states in four completely different locations, each with different economic industry drivers.